Have you shoveled your sidewalks after the latest big snow? Do you wish you didn't have to? LONGMONT, Colo. -- Have you shoveled your sidewalks after the latest big snow? Do you wish you didn't have to? That's exactly what inspired a Longmont startup to build the world's first commercial-class self-driving robot for snow removal, the "Snobot." 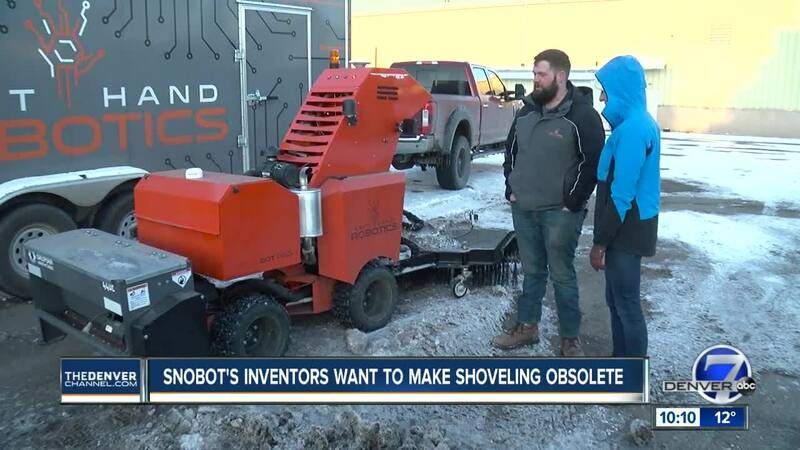 "It's a robotic tractor for clearing snow off of sidewalks and pathways," explained Clint Ott, the director of engineering at Left Hand Robotics, which started working on the robot in June of 2016. "Robots, in general, are very good at taking over strenuous, repeated tasks, and I think anybody who has had to shovel their driveway or sidewalk knows that's the perfect definition of snow shoveling, strenuous and repeated." The Snobot works by first using a path recording tool before it snows to create GPS points along a path. Those points are uploaded to the software and transformed into a path program. When it snow, the robot can be started from a smart phone app and start clearing snow along the path, using on-board cameras and sensors to avoid obstacles. Billed as doing the work of six shovelers in less time, for now, the robot is just for commercial use. The City of Longmont is already using one to clear bike paths. "It's great for Colorado, we get heavy snowfall and sometimes unexpectedly," said Ott. "It's hard to get contractors to get their snow clearing employees to work early in the morning, but if they have a robot on site, and it doesn't have any warning, you can start it up from home if you need to." The Colorado startup has already raised $3.7 million and recently started shipping machines to customers all over the country. The biggest setback, though, is the need for more snow in Colorado. "We actually need snow falling on the ground to get good testing," said Ott, who said they sometimes take the robots to Nederland and Breckenridge to do testing where there is more snow. "Every time it snows here is a treat." The Snobot costs about $35,000 for everything, including the path recording tool. In 2019, the company plans to expand to create a robot for mowing turf.